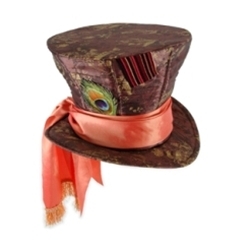 This deluxe mad hatter hat is expertly constructed with the finest taffeta fabric and is imprinted with lovely details appropriate to only the maddest of hatters. Features a faux peacock feather and the iconic 10/6 badge is attached to the band. The band also features authentic gold tassel trimmings. Fits up to 60 cm heads (23.5 inches).